Hello to all my blog reader. After a long break since my last bridal bouquet giveaway (Sorry! there has just been too much on my plate) I hope I can start to do this monthly again. I am giving this pretty handmade boutonniere as the prize for my march giveaway. 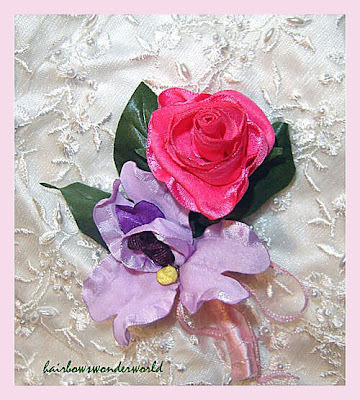 You can have it as a pin on corsage too. Simply let me know that you want me to add a brooch pin to it. * Every month I will post a giveway, free entry for all my blog readers - time and date will vary. IMPORTANT! Please leave your email adress so I can contact you if you win. Or you can convo me on Etsy to let me know your email address. Hope you have fun and good luck! I left a comment on your Ribbon Butterfly Tutorial post! I'd like to see more of the multifunction headbands like the Sunset - Fabric Flower Headband in your Etsy store! I left a comment on your Bridal Bouquet Sale Post!!! Stunning!!! I love the VINTAGE LOVELY Pink and Cream BRIDAL BOUQUET, AMAZING!!! ! Thank you so much everybody for your participation. This contest now ended. I'll post the winner here tomorrow. Good luck everyone!